Easter in Mexico is a two-week holiday which consists of Semana Santa and Pascua. Semana Santa, the Holy Week, begins on Palm Sunday and ends Easter Saturday. Pascua starts on Easter Sunday and ends the following Saturday. Semana Santa, the first week, and schools and some business are closed for these holidays. In Mexico, during the first week you will find elaborate processions and rituals being performed. There are re-enactments of Jesus being captured, tried and crucified. To celebrate the rising of Jesus, the second week begins with Pascua. 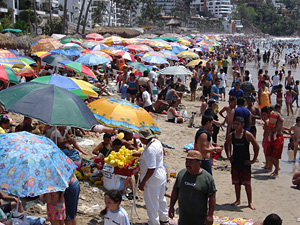 This is a happier time where many Mexicans travel to tourist destinations, usually beach towns such as Puerto Vallarta, Acapulco and Playa del Carmen. This is when these tourist towns swell to levels not seen during the normal year (even in high season). Many locals actually leave the tourist towns and head for areas in Mexico where others have left or take time to visit another country. If you are planning a trip to one of the tourist towns here in Mexico during this time, especially beach towns, please plan ahead as most hotels and rental properties book up early. And please please be aware that the beaches and stores will be very crowded, so if you want a less busy vacation, consider coming outside of the two weeks of Easter in Mexico.